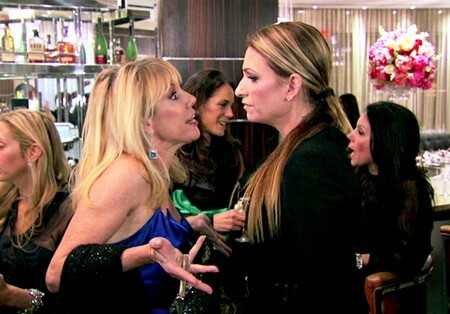 If you’ve watched The Real Housewives of NYC then you know Ramona Singer and Heather Thomson just don’t get along. Heather planned a girl’s trip to London and never invited Ramona, which kicked off all the bad blood. Heather felt Ramona coming along would equal drama so she never extended an invitation and that completely flipped Ramona out. She was hurt, offended, demanded an explanation. Heather told her she wasn’t sure if they actually were friends, they talked and I think Heather tried (unsuccessfully) to squash the bad blood. Aviva had a party to celebrate her fifth wedding anniversary and at that party, Heather attempted to talk to Ramona. Here’s Ramona’s take on the encounter, straight from her blog. I’m going to go out on a limb here and state the somewhat obvious. Of course Heather talked behind her back, because Ramona discussed the snub with everyone and everyone brought it to Heather. It amounts to more crazy Ramona drama, something she just can’t help but bring to each and every situation. She’s like that aunt that everyone knows is bonkers, but tolerates any way. I don’t think Heather is crying over the lost opportunity to be Ramona’s friend either. She’s probably relieved to see her future without Ramona’s drama in it. Have you been watching these two go at it? what are your thoughts, will they ever be friends? Tell us in the comments below!